The picture just gives you an idea of what you will knit but (hopefully ;-)) don't spoil the surprise. 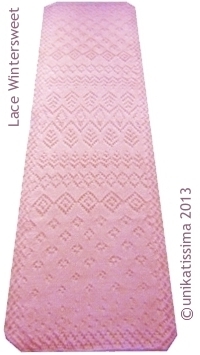 This year the pattern is designed lengthwise symmetrical and not meant to be repeated in height but its width is variable. the total length are 438 rows. got a tablerunner of about 25 x 130 cm (about 10 x 51 inches). Depending on my daily energie I knitted a daily pattern section in appr. 25 min. got placemats of about 27 x 39 cm (about 11 x 15 inches). 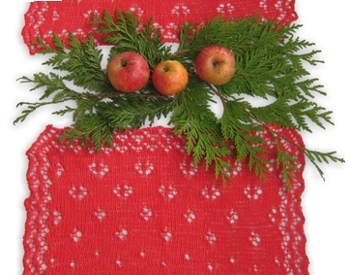 I knitted a placemat in appr. 3 hours 25 min. got a shawl of about 37 x 124 cm (about 15 x 49 inches). Depending on my daily energie I knitted a daily pattern section in appr. 40 min. got a scarf of about 22 x 165 cm (about 9 x 65 inches). Depending on my daily energie I knitted a daily pattern section in appr. 20 min. Note: The scarf was knitted with an early (and not so beautiful ;-)) version of the pattern. The number of stitches/rows is however the same. Dec 1, 2013 at 11 am: uploaded corrected versions of day 1 pattern, placemat pattern and symbols/abbreviations file. (PDF ~59 KB) by using my patterns. (PDF ~49 KB) (corrected version uploaded Dec 1, 2013 at 11 am). Important note: It seems that some of you with mobile devices can't read my PDFs. Most of my PDFs are password protected against copying and I'm sure that there are more of this kind of PDFs out there. If that's the case please check the appropriate app stores for 'PDF reader' or 'PDF viewer' apps, there should be at least one that will make it possible to read the files. I would love to make this lace shawl it is really beautiful. Thanks for doing the calender again this year. This is the first time I have seen this. I’d love to do this! Can’t wait. Will get my supplies ready! I hope that it will be fun! I really love the shawl, cannot wait to start. It looks stunning. Question: I think of starting with an Estionian border and maybe even knit one on both sides too. Is that possible you think? I would love to see what you will make, please think about coming to the ravelry group unikatissima (see also note). Thank you so much for this generous Advent gift, Susann! I have the perfect scarlet yarn in my stash, and this is its destiny. I can’t wait to do this. It is my first KAL ever. Thank you for doing it. I’ve only just now found you, so my plan is to get all of next year’s gift-knitting and crocheting done far enough in advance that, if you do this again next year, I won’t feel guilty taking some time knitting for myself! you’re welcome and I’d be honoured if you took part next year, but why don’t you spare some time in January/February to make you a beautiful Spring shawl? I saw the Lace Wintersweet and it is lovely. One of the gals in our Guild knitted it and I sat there in awe looking at it. I have just started the Advent 2013 in light pink. I am loving the way you’ve clearly displayed the easy to follow charts in only a few lines each day! I think I’d have less trouble following lace charts if they weren’t so large in one diagram! I just have two questions. One is, why, every so often do I find myself one or two stitches short and then the magically reappear? The second question…I will be blocking it, and it is 100% wool, so it will stretch quite a bit. I’m only doing two repeats of the centre stitches, therefore 45 stitches. I’ve just pinned it after doing 120 rows and hope it will come out much longer and wider than I see. Thank you for your free gifts! sorry that I am so late answering, I couldn’t do so sooner. First of all: thank you for knitting (and liking :)) my pattern! I am sorry, but I don’t know why you find yourself one or two stitches short and then they magically reappear. As for your second question I didn’t quite catch what you want to know. And I don’t know either what sweater patterns you refer to, because I only have shawl patterns. Sorry that I couldn’t help you better. Thank you for showing them! so much for these patterns!